Question 14: a reference to the influence of the domestic background on the gifted child. In paragraph A, the author mentions the importance of ‘home educational provision’ and ‘reported verbal interactions with parents, number of books and activities in their home etc.’ Take a look at the lines 4-6, “For example, a very close positive relationship was found when children’s IQ scores were compared with their home educational provision (Freeman, 2010)”. These suggest the fact that home or domestic background of a gifted child has a great influence on him/her. Look at lines 2-3 of paragraph D. The author says, “Conversely, teachers who have a tendency to ‘overdirect’ can diminish their gifted pupils’ learning autonomy.” The line means that if a gifted child is ‘overdirected’ / given too much guidance by their teachers, the gifted pupils’/ learners’ autonomy / independence is badly affected. In paragraph F, the author directly argues in lines 3-5, “Fear, for example, can limit the development of curiosity, which is a strong force in scientific advance, because it motivates problem-solving behaviour.” So, fear (synonymous to anxiety) has negative effects on the development of curiosity. Here, new methods = classroom techniques, favour = found to be particularly useful, socially-disadvantaged children = children from deprived areas. 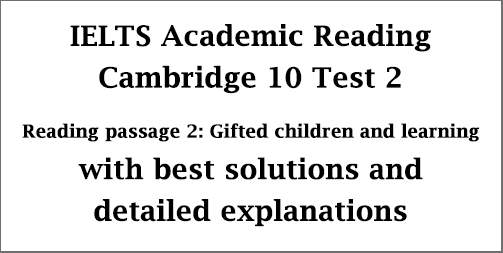 Question 18: Less time can be spent on exercises with gifted pupils who produce accurate work. Question 19: Self-reliance is a valuable tool that helps gifted students reach their goals. In paragraph E, we find the research findings of Simonton in 1988 who came “ . . .. . … to the conclusion that above a certain high level, characteristics such as independence seemed to contribute more to reaching the highest levels of expertise than intellectual skills, due to the great demands of effort and time needed for learning and practice.” The lines suggest that independence or self-reliance contributes more or helps a lot to reach the highest level or goal. Question 20: Gifted children know how to channel their feelings to assist their learning. Take a look at the last lines of the last paragraph, “In Boekaerts’ (1991) review of emotion in the learning of very high IQ and highly achieving children, she found emotional forces in harness. They (which mean the gifted children) were not only curious, but often had a strong desire to control their environment, improve their learning efficiency, and increase their own learning resources.” These lines mean that gifted children actually know to control their learning environment which helps them better to learn more. Question 21: The very gifted child benefits from appropriate support from close relatives. In paragraph A we find about close relatives’ support from the research of Freeman (2010). Look at lines 7-9, “The higher the children’s IQ scores, especially over IQ 130, the better the quality of their educational backup, measured in terms of reported verbal interactions with parents, number of books and activities in their home, etc.” Here, parents are the close relatives who support gifted children to learn. Question 22: Really successful students have learnt a considerable amount about their subject. Question 23: One study found a strong connection between children’s IQ and the availability of _________ and ________ at home. Question 24: Children of average ability seem to need more direction from teachers because they do not have ________. Question 25: Metacognition involves children understanding their own learning strategies, as well as developing __________. So, the lines suggest that along with the learning strategies, metacognition includes emotional awareness. Question 26: Teachers who rely on what is known as _________ often produce sets of impressive grades in class tests.